InterNations Business Solutions, the global expat network, found that both overseas assignees and international hires (people who find a job abroad on their own or are hired by a local company), as well as any 'trailing spouses', fared less well in the UK than the support on offer in many other countries. "Countries such as the Netherlands excel in supporting global employees," says the latest Expat Insider Business Edition Country Focus report. "They set a benchmark for employer assistance and show that employees that are better supported with their relocation and integration experience an easier, shorter adjustment period and a higher satisfaction with life in general." The report, which looks at nine different types of relocation support that global employees and their partners receive from companies, found that international hires working in the UK were particularly badly served by their companies compared to their contemporaries elsewhere in the world.And while foreign assignees sent by their companies to work in Britain were found to receive some benefits, specifically as far as moving and financial compensation was concerned, their overall employer support was still low compared to other countries.The report looks at the situation of expats working in China, France, Germany, Hong Kong, the Netherlands, Switzerland, the UAE, and the US, in addition to the UK. Only two-thirds of foreign assignees in the UK had their move organised by their employer, which was much lower than the global average of 75 per cent and was the second lowest among the nine countries featured. Only foreign assignees in Hong Kong (63%) received less support. Only 19 per cent of UK international hires were offered a lump-sum payment, much lower than the global average of 36 per cent. Similarly, only 23 per cent received help in organising their move, compared to 43 per cent globally. Again, only in Hong Kong did international hires get less support (15%). 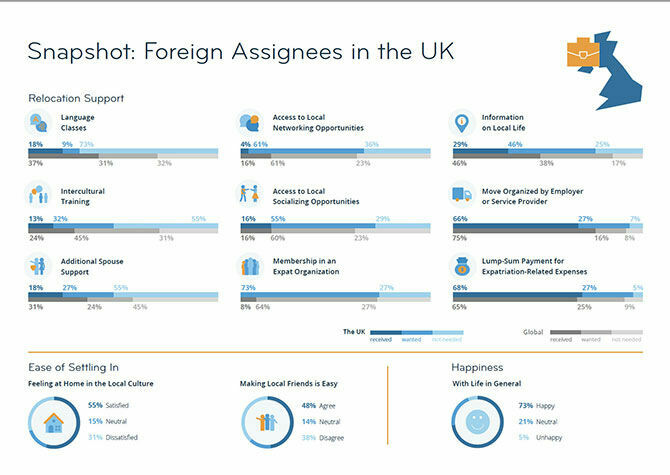 Foreign assignees in the UK came at the bottom of the list in such areas as receiving information on local life (29% v 46% globally), spousal support (18% v 31%) and intercultural training (13% v 24%). Only four per cent of foreign assignees in Britain and 12 per cent of international hires were offered access to local networking, compared to 16 and 17 per cent respectively globally. "The support is even more bleak when it comes to membership in an expat organisation," said InterNations. "This is the type of relocation support that the smallest share of both expat types received but most of them would have liked: just three per cent of international hires were offered this type of personal support, but 66 per cent would have liked it." 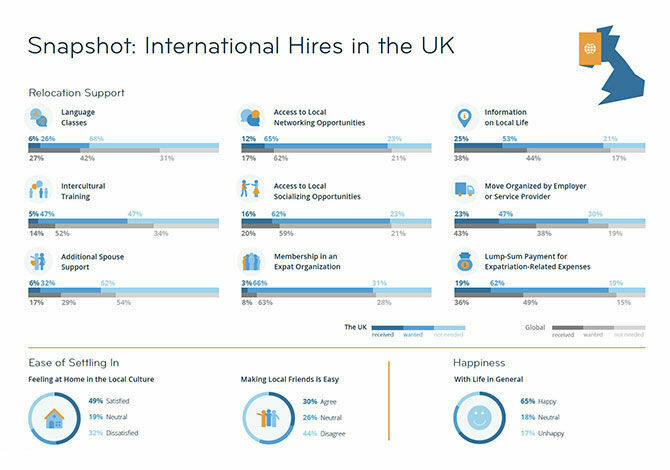 However, the report added: "Despite the extremely rare personal support for global employees in the UK, they don’t seem to struggle too much with settling down in the country: 49 per cent of international hires state they feel at home in the local culture and 55 per cent of foreign assignees say the same. "In general, foreign assignees in the UK seem to settle in better than international hires, which might be due to the fact that they at least receive more practical support from their employers. 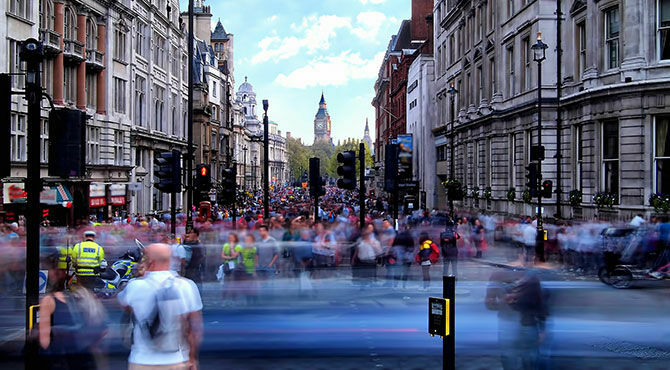 "In fact, 63 per cent of foreign assignees find it easy to get used to the British culture, which is five percentage points higher than the global average and the second highest share among the nine countries featured. "* The findings in the report are based on the annual Expat Insider survey conducted by InterNations. Last year, 18,135 expats from across the globe took part in the survey.